November 6 - 20, 2011 - Thank you to all who placed bids and helped us help others!!! 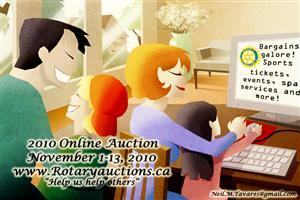 On behalf of the Rotary Club of Milton, thank you for your interest in the 2011 Halton Rotary Online Auction. The auction is now over! It ran from November 6-20, 2011 at www.rotaryauctions.ca. Next fall click on the Milton/Oakville link. There are some great deals to be had. Due to your generous assistance last year for the online auction, we achieved our goal - in excess of net $10,000. As with all Rotary projects there is no administrative overhead … only the software, advertising and credit card charges … the storage facilities are donated. Leafs tickets. Golf packages. Gift certificates and much, much more. Keep an eye on the items you want to win so you don't get outbid.